This spiritual successor to the NBA Jam series brought the "boom" back to "boomshakalaka." 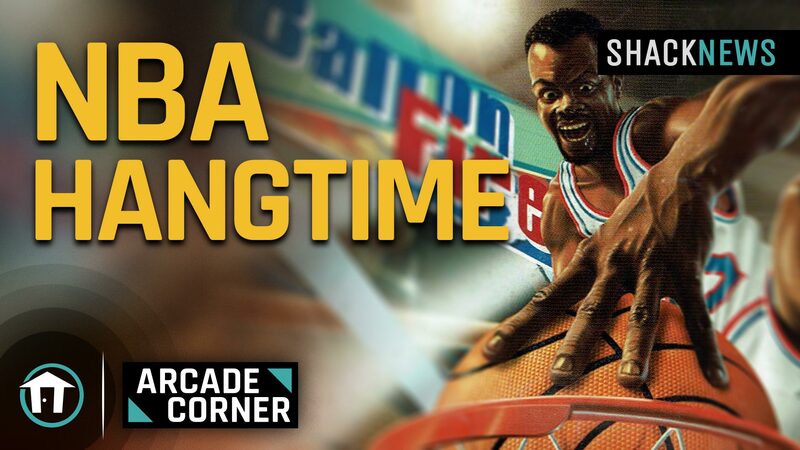 Join us as this week's Shack's Arcade Corner takes a look at NBA Hangtime. NBA Jam is probably one of the most noteworthy sports experiences to ever hit the arcade circuit. When it came time to make a sequel though, there was one small issue: Midway, the company who had developed NBA Jam (and several other noteworthy titles of the late arcade era) did not own the rights to the franchise. So, instead of making a true sequel, the same team went on to create NBA Hangtime. Hangtime shares a lot of characteristics with its predecessor. In fact, it would not be a stretch at all to call it basically the same game with a number of small tweaks and improvements, as well as an updated roster for the 95-96 NBA season. A few moves like the alley-oop and the ability to double dunk were added to the game, but at its core, it was still all about 2-on-2 arcade-style action. It also features many of Midway’s signature arcade features from that time, like a three-digit code that could be entered before a match started to unlock things like big head mode, or unlimited turbo. If you thought this week’s Shack’s Arcade Corner was a real slam dunk, be sure to check out all our older episodes at the Shack’s Arcade Corner playlist over on Youtube. And while you’re there, be sure to subscribe to the Shacknews and Gamerhub Youtube channels. We’ll be back in the new year with even more nostalgic looks back at your favorite arcade games from yesteryear.